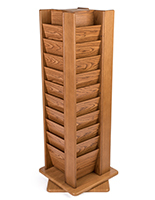 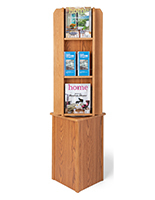 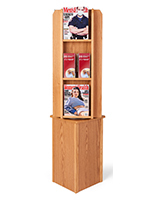 This wooden publication stand can be placed in the lobby of a professional office, hospital, or hotel, or on the floor of a retail showroom. 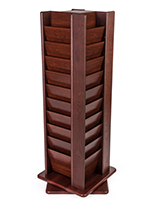 The eye-catching red mahogany finish attracts the attention of passersby to its contents, dispensing it effortlessly, due to the turning top. 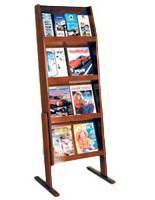 A sturdy base keeps the unit stable on this pamphlet rack. 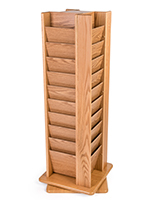 This wooden publication stand that is a literature holders system is expensive looking, but affordable, especially when purchased in bulk! 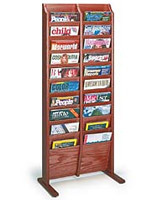 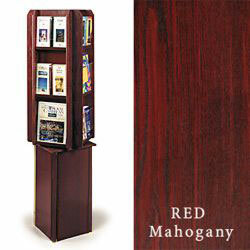 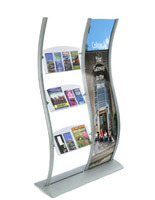 This adjustable fixture has a multiple pocket design to house both magazines and trifolds.